HALEAKALA NATIONAL PARK, HAWAII — Atop Hawaii’s Mount Haleakalā I stand looking down at the clouds, white and rolling softly around the volcano’s edges. It’s just before noon and the air is already ablaze. On my short hike along the crater, my skin burns within the hour. Between the heat, altitude and the impending fiery eruption, the lip of this caldera does not strike me as a hospitable place for plant or animal. But there is one organism that thrives in this rocky, barren moonscape. In fact, it has so expertly adapted to this particular rim that Maui’s Mount Haleakalā is home to one of only a handful of known populations on the planet. Meet the silversword (Argyroxiphium sandwicense macrocephalum) — a brilliant silver plant with spiky, swollen leaves that fan out, fern-like, in perfect symmetry. Their glimmery gray hue lends a razzle-dazzle effect like an aloe plant that loves to disco. Spotting one is a surprising sight among the brown and black desert landscape. And it may soon become even harder as this spectacularly evolved plant faces the hot blaze of climate change. The plants have struggled to keep up with the hotter temperatures and paltry rainfall that has quickly arrived on Haleakalā in recent years. Silverswords grow in a bush-like formation for all but the final year of their lives, when mature plants send a huge stalk straight up their middle, and the bushy spikes collapse at the base. This final thrust, which is 20 to 90 years in the making, is the plant’s sole act of reproduction. This lengthy reproduction cycle makes for slow adaptation, which doesn’t work to the silversword’s advantage in Hawaii’s rapidly changing climate. Just a few steps down from the crater is the visitor center for Haleakalā National Park, which encompasses a small circle around the very tip of the volcano. While tossing a frisbee in the parking lot, I notice the first spikes of a silversword sticking up from the dirt in dozens of black pots, each marked with a red or blue tag. The pots are stacked in rows upon a trailer topped with a greenhouse. Some of these potted silverswords are getting more water than others, I learn, as I step closer and read a sign posted by the National Park Service. Researchers from the University of Hawaii as well as park staff are hoping to suss out exactly how much water these plants need to survive at higher temperatures in an effort to save the silverswords from a future that may prove too hot and dry. The Department of the Interior is starting to understand and consider climate change in its planning and management, and has directly ordered the park service to prepare, as well. 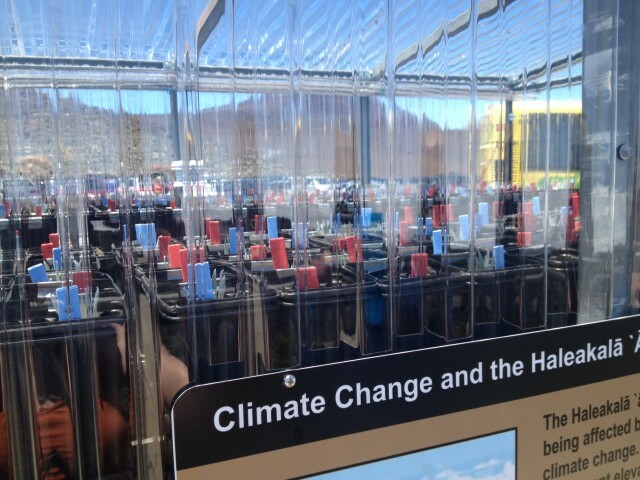 Hawaii and Alaska are two of the first states to take tangible steps on public lands, such as Haleakalā National Park where arguably one of the most urgent cases exists. As I gaze out at the Pacific Ocean turning over into the horizon, I consider the silversword’s chances of enduring these drastic changes. The plant has had some close calls before — from visitors who used to scoop them up as souvenirs to cows that snacked on their succulent spikes. Mitigation and recovery efforts have all been successful so far at keeping the silverswords alive in a global habitat that measures only 250 acres in size. With nowhere else to go and given the slim chance that the plants are capable of adapting quickly enough on their own, the silversword’s keepers are once again trying to ensure its survival for as long as possible — but this time, the threat can’t be kept out with fences or park rules. 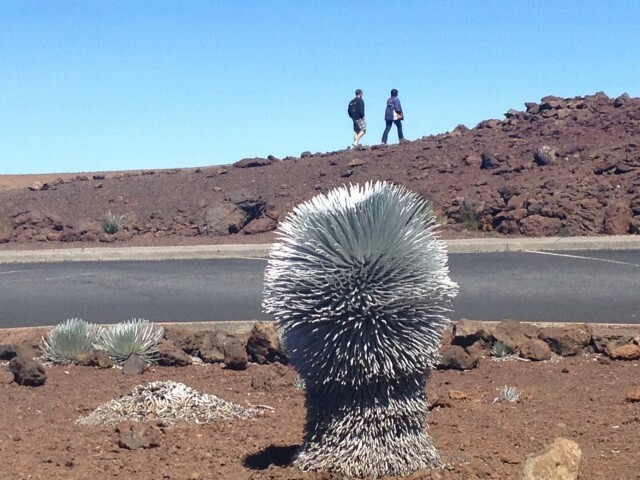 The atmosphere right here in this volcanic crater is changing and it soon may be too hot to call home, even for the silversword.